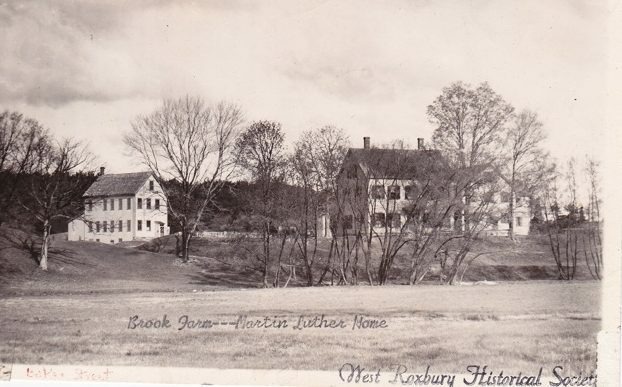 Photo: View of Brook Farm in the orphanage era from Baker St. Reception on Thursday, October 6, 2016, 6:00 to 7:45 p.m.
New Brook Farm presented an exhibition of paintings, prints, maps, and photos at the library to celebrate Brook Farm’s 175th anniversary. George and Sophia Ripley bought the Ellis farm on October 11, 1841. Most of the items in the exhibition are archived in the West Roxbury Historical Society, housed in the library. For information, please contact Gretchen Dietz.